We all know we shouldn’t judge a book by its cover – but is it polite to judge it by its title? Not exactly an uplifting subject – and yet, it was all that and more. Based on true life events, this fictional account focuses on a small English village in which Plague has taken hold. Under the guidance of the local minister, the town quarantines itself – and through the eyes of Anna, we witness moments of horror and joy, life and death, infection and healing. As Plague ravishes this small community, the reader witnesses Anna’s spiritual growth. As a woman who has faced monumental losses, she is able to face life one step at a time, to learn, to find her purpose as a healer and midwife, and to discover her voice – no small feat for a woman in 1666.
rogress as she moves from mourning to survival to living. For me, I was pleasantly surprised to see that the character’s process was so deeply entrenched in gardening and her learning of plants and their healing qualities. Then, I began to reflect on my own years of wonders and how entering the garden helped me to cope, to breathe, to move forward. I thought of the months following my grandmother’s passing, when I went to her vacant house to dig up her Hyacinths and transplanted them into my own yard; of the first time I raked mulch across a flower bed following my car accident which had resulted in a head injury; of the first time I watered the garden after a heart attack and the first round of coronary stent placement; of countless hours of weeding following stressful days at work — simple tasks that provided simple answers to complex issues. While these moments certainly do not compare to the magnitude of Plague, they are still challenges which we face and rise to and place into a proper perspective. I think we all have these moments. And when we do, we find our means to grow — 15 minutes at a time to one day at a time. Eventually, a year goes by and we realize that we survived and that we are, in fact, alive. 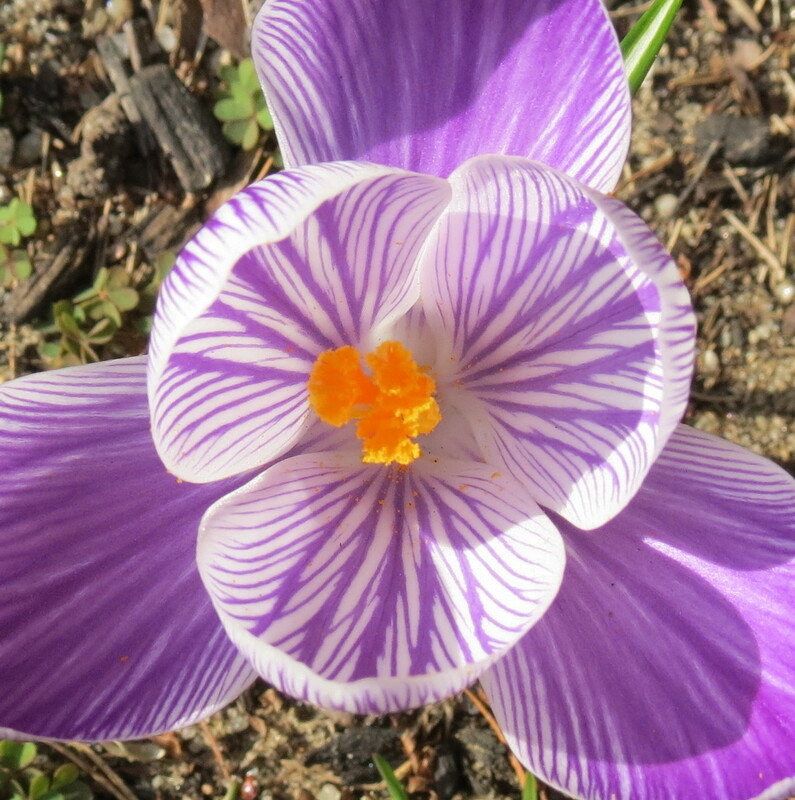 The wonder of "Pickwick" Crocus. It’s really no different than what’s happening in our own gardens right now. While many of us comment on the winter that never was, there is still something so refreshing about the first hints of spring peeking up between winter debris – like the absolute wonder of “Pickwick” Crocus and its markings. I know we have January 1 to mark the start of a new year, but wouldn’t it make sense to mark the year by spring? It’s the moment when we look about and see buds on branches, when the length of a day grows, and in a moment, we realize that we have come through our darkest days. Like Anna, there is much to learn and to consider – but in her story, we can find comfort that while life may change, it’s still life – and in life, there is wonder. There’s a lot happening in the potting shed. Click on The Seed Monologues tab above for regular updates! ‘Year of Wonders’ was indeed marvelous. Terrifically well written seeing that it was a debut novel by Geraldine Brooks. Truly memorable! I hope to read more of her works. I’m with you. This work has opened up a whole new author for me. Thanks for commenting! So timely for me. The book group I co-founded 25 years ago recently selected Year of Wonders for next month’s book. Thanks for inspiring all of us to read it. Jill, timing is everything. 🙂 I’m sure you and your club will love this book. I cannot say enough about it! Enjoy. I was enthralled by this book when I read it. I love how you related it to your own year of wonders though. Nicely said, as always. Thanks for the lovely reminders–and I’m with you on spring marking the new year. It’s such a thrilling time–so many wonders in the new spring green showing and vivid colors popping out everywhere. Char, I have to tell you, this book had me thinking about all sorts of wonders — personal and global. I’m sure it fits nicely with the work you do on your blog. Small wonders. Everyday. Thanks for commenting. Handed off the Very Inspiring Blogger Award to you today on my site. (Of course I’m late notifying you–I always forget something on these award thingies…and don’t feel obligated to do the whole blog award accepting thing if you don’t like those things. I just do it occasionally to spotlight certain blogs I like. I definitely don’t stick to the ‘rules’ because they can become quite burdensome.) I definitely like your posts though. They’re unique and fun. Wow! Many thanks. It is always an honor to be recognized. I will visit your site to check out the rules. Thanks for sharing! I have put this book on my list to read, and I thoroughly enjoyed reading your post. Gardening has helped me through a lot in my life as well … it’s my meditation. I really don’t know what I would have done without gardening. I always feel emotionally and psychologically recharged after I garden even if I’m physically exhausted. I completely understand — and I think most gardeners would feel the same. I find that in the garden, all of my senses are working — and in that, there is rejuvenation. Enjoy this book! I’m going to order this book as soon as possible – I live quite close to Eyam in Derbyshire which is a village that infamously quarantined itself once it was obvious that the plague had arrived… it’s a fascinating place to visit and I’d love to read more about the plants and and their uses at this time. Actually, the author was inspired by the events in Eyam — so the book is closer to you than you think! Enjoy the read! I’ve never had any attachment to January 1 myself and like you have long felt that spring was the start of a new year for me as we throw open the windows and get outside and get our hands dirty. Amen to that! I love that first day when the windows can be opened and the house can breathe. Excellent review, Kevin. Thanks as always, for lovely writing and for weaving such a fine tapestry where so many find themselves. I’m so glad you enjoyed it — and do take some time to read this book. Enjoy! Year of Wonders was the first Geraldine Brooks novel that a read. I loved it and have loved every book of hers since. Recently, I re-read Children of the Book, enjoying it at least as much the second time as I did the first time; and Caleb’s Crossing was one of my Christmas break treats to myself. The lovely thing with falling in love with the writing of a living writer is that there are still more books yet to come. Beautifully said. I’m looking forward to some time off, so I can continue reading her works. Certainly one for the to get list. Some books you keep on remembering for the rest of your life. Grapes of Wrath has been the one that has affected me most…so far. I know what you mean about books. For me, it’s “Atlas Shrugged,” and now “Year of Wonders.” Happy reading. Not only an enticing book review, but a reminder of “one day at a time” and the simple things we do to move on. I, too, will read the book, probably in the summer!! Maria, I think you’ll really enjoy it. There’s so much in this book.